Remember that accountability group in college where everyone went around the room and confessed their sins? You knew what everyone’s struggles were and sometimes you suspected your buddy was lying to you, but you didn’t quite have the guts to call him out. So it all broke down and everyone was still living with the same struggles as before. When you tried accountability you thought it was the key to everything… I mean it works so well on paper, but after you tried it you realized you were still lying to your mom, looking up swimsuit models on the internet, and letting curse words slip at the same frequency as before… but now you also had to lie about it once a week. The solution to this problem is actually quite simple though, you only need one person in the room who can see. Put someone in the room who isn’t an idiot and accountability might work (again I know this sounds harsh… but hang in there). Someone who has been around the corner can tell you how to get there (and doesn’t mind redirecting you when you blow it… because they actually know the next step)… That’s why there is value in having older mentors. Do you want to be wise? Do you want to grow in your relationship with the Lord? Do you want to progress on the path of sanctification (be more holy)? Then find some godly older men to be your mentors! When you are young you are looking for approval. It’s easy to hang with people your age because they are easier to impress. If you’re honest, part of you is a little bit threatened by hanging out with godly older men. I mean, after all… they aren’t talking theories anymore like you and your crew… they have actual battle scars (from real battles!) and war stories (from real wars!). But if you want first hand information on how to win the fight… these are the people you need to listen to (because they’ve been kicked in the teeth by the enemy and are still grinning!). I was blessed early on to be mentored by several Godly men including my dad and my mom’s dad. I’ve served with two great pastors and sought out advice and wisdom from other great men along the way. There were times where I was intentionally the only idiot in a room full of wise guys because I needed their wisdom. My wife and I attended Sunday School Classes with older couples and intentionally befriended men and women who would invest in us. You see an idiot in a room full of idiots stays… get this… an idiot. But an idiot who will listen to wisdom from a wise guy… at least has a chance of becoming a wise guy. Oh and one more reason you need to be mentored by someone older. You are looking for affirmation and you won’t find what you really need from your peers. But when an older guy affirms that you are on the right path, you are closer to becoming the confident young man God called you to be... so next time you feel the urge to get an accountability group together invite a godly older gentleman to the group and ask him to pour into you and ask him questions about whatever it is that causes you to struggle. One word of caution: Not every older gentleman is wise about the same things. If you have financial goals pick a guy who seems to have his financial affairs in order. Unfortunately there are a lot of older men who spent too much time trying to impress their friends that they never picked up any wisdom along the way and they have little to share with you other than the testimony of wasted years. I pray you don’t become one of them. Check into 1 Kings 12 to see a story about a guy who was more worried about impressing his peers than listening to the advisers his father appointed. Family Devotional: It’s More About Rhythm than Time. I’m so thankful for my parents and their commitment to the Lord. So much of what I have to share here is because of their testimony in my life. I had great models of family devotional time to build on and improve. I realize that not everyone grew up in a Christian home or Christ may have not been emphasized at home the same way he was at my house and so I want to give you a glimpse at what we do so you can have a model to build on and improve with your family. You may have some other great helps, practical suggestions, resources and/ or ideas, if so, please share with us in the comment section below. It’s more about rhythm than time. Leading your family is more about finding a natural rhythm in your schedule than setting up a specific time or meeting for a specific time. For our family the rhythm looks something like this on a weekday. 6AM – I have my own study time. Through the years I’ve done various things but I keep coming back to The MacArthur Daily Bible: Read through the Bible in one year . 6:20ish – I’ll have breakfast with my 8-year-old and I will do a devotional together before school. Right now we’re working on a devotional that I wrote for our students but mostly we use Long Story Short: Ten-Minute Devotions to Draw Your Family to God . I’ll read from the book and she reads the scripture portion each day. Around 7:30ish – I’ll have coffee and read a story from The Jesus Storybook Bible to my 4-year-old before he heads off to 4k. Evenings when I’m home before bedtime (Roughly 3 nights a week) we’ll have a prayer time around 7:30ish (our goal is to get them in bed by 8PM). Right now we’re praying for a particular UUPG and we made a cube that has pictures and writing based on Romans 10:13-14. One of the kids will roll the cube and it will help guide us in how to pray for our UUPG that night. We pray from youngest to oldest (with dad always going last). We pray simple, but heartfelt prayers. After everyone has prayed we say the Lord’s prayer together and then we play a game with the ten commandments where a family member will name a commandment and call on someone else to say the next commandment, etc. then we’ll go over a series of verses that the kids have memorized (the Roman’s Road, Proverbs 3:5-6, Matthew 6:33, etc.). The whole things lasts about 15-20 minutes from start to finish. The real value is that each of these moments provide a great reference point for further conversation. I can’t tell you how many times we’ve talked about forgiveness based on the Lord’s prayer or sin based on the 10 commandments. There are also times were we have great gospel centered conversations based on a story we’ve read or a devotional. Then there are times where I will share about what I’ve read in my own time in the word and how it applies to something that one of the kids mentioned. If you are looking to lead your family and aren’t doing any yet don’t try and start everything at once. Pick one habit that you think will fit or work in your routine and make it work for you. For example you may have to clock in at 5AM and so their is no way you could possibly read with your kids before school. Maybe you could record a video (using your ipad or phone) and have it ready for them to watch while they are at breakfast. Or maybe you have to be out of state/ country for your job. Challenge your children to memorize a scripture passage with you (Like the 10 commandments or the Lord’s Prayer) and make it part of the phone call when you are able to call home. What are some other great ways to engage your kids with the scripture on a regular basis? I read Road Trip to Redemption: A Disconnected Family, a Cross-Country Adventure, and an Amazing Journey of Healing and Grace a while back and was greatly encouraged. The Author, Brad Matthias, shares a detailed story about his family’s breakdown and reconnection. The book chronicles a road trip that the author and his family took in search of healing. I grew up in the general area where most of the road trip takes place (the North West US and Southern Canada) and I remember traveling to some of the same sights with my parents and grandparents. So I have to admit that part of me was longing to go on a similar trip just to re-live part of my childhood. The real gold to the story though wasn’t the tale of the open road (though the Matthias family does encounter a few obstacles and victories along the way), but of how the family reconnected throughout the journey. I appreciated the insights shared by the all the family members in their journals and was blessed to be able to share in their journey in a small way. I don’t think this book was intended to be an instruction manual as much as an encouragement. The author is transparent in his struggle to illustrate that he hasn’t always been there for his family like he should, but even broken families can be restored and brought back together through the power of the gospel. I really liked this book and highly recommend it to anyone who is looking for a good non-fiction read. It’s especially good for dad’s who are looking at how to reconnect with their teenagers. It’s really not a “how to” manual, but it does provide some solid advice in the form of a story. Is Church Designed for Sissies? Why Men Hate Going to Church by David Murrow is a compelling book about the gender gap that is growing in congregations world-wide. Women outnumber men in some congregations with the differential ratios as high as 63 to a measly 37 percent. In his newly revised ground breaking book Murrow attempts to explain the feminization of the church and what pastors and leaders can do to restore the masculine appeal. The thing that piqued my interest most about Why Men Hate Going to Church is that way that Murrow lines out his argument for masculine church being a Biblical model. According to Murrow (and he has some interesting stats and historical data on his side), the church (in general) has slowly drifted into a feminized form of Christianity which by nature appeals to women and excludes men. The most damaging element of the slide into gender favoritism is that Church has historically appealed to men. I hope this letter finds you doing well and growing in your relationship with God. Last time we spoke, we talked about being in the word of God. I want to encourage you to keep up your commitment to reading the scripture. Along those lines please read the scripture passage I have enclosed. This week I want to share with you what the Bible says about being the husband of one wife and how to best prepare yourself to lead in your marriage one day. I know that this passage deals primarily with appointing pastors and elders, but think with me for a moment. Do we expect more of our pastors than we do of our people? Is it right for a believer who is not the pastor to be sleeping around, getting drunk, quick tempered, rearing children that hate God, greedy, and undisciplined? No! We expect Christians to act like Christians and we expect our pastors to model the Christian life. (As a pastor I pray that you have seen Christ modeled in my life along the way.) So while this passage is about pastors… It also out a picture of what a mature Christian man looks like. 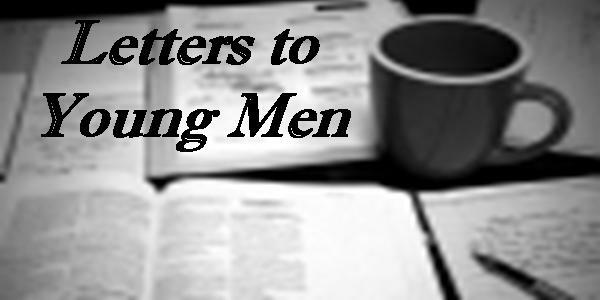 That being said, you are to aspire to be a mature man in Christ. So now what about that “husband of one wife” phrase? How doe that apply to you as an unmarried man? The idea being communicated in the text is that of “a one-woman man.” How does a single man make sure that he is a one woman man? … You guard yourself from craving of soliciting the attention of a plurality of women. In short, if you like a young woman, tell her. It doesn’t have to be awkward, but it is important to define the relationship sooner rather than later. If you don’t, you may end up leading someone on. If you aren’t interested in marrying a young woman, don’t flirt with her. If you think that she likes you and you don’t like her, remind her (and act towards her) that you are just friends. I remember early late in college around the age of 21, I found myself newly single and eager to share my insights on life with anyone of the female persuasion who would listen. Little did I know that I was leading people on more than I had planned. All the girls I had been “flirting” with told the one girl I really liked that I flirted with everyone and I got dumped before the relationship ever began. In the long run it ended up working out well for me in that I sobered up to how I was leading some young women on, learned more about biblical manhood and womanhood and was careful to define relationships. I hope to spare you some bumps and bruises along the way by weighing this scripture and my advice. Are you living like a one woman man? Are you leading anyone on? Remember sometimes women can put more stock in a friendship than we do. Is there a relationship that you need to define? The wait is worth the reward. Have I shared with you before about how I courted my wife? It’s a good story. You should look it up if you are interested. I hope this letter finds you doing well. I want to be a source of strength and encouragement as you fight against the flesh and continue to grow in Christ. I know it sounds cliché to say that when times are tough my greatest source of strength comes from being in God’s Word. I know that there are many leaders in our day and age who make light of the daily discipline of reading and studying God’s word. Their reasons sound good. They will say that believers in the early church could not read and only heard the word preached. This is true, but they miss a vital point. Because the word was scarce, it was sacred. The danger in our day is not a lack of accessibility, but too much accessibility. No doubt you have more than one Bible and possibly more than one translations. Here is my challenge to you… Treasure God’s Word! Set aside a Bible that you will read from each day. Set a particular time of day. Get a journal and take notes. When beginning the daily discipline of reading God’s word, one of the best things you can do is take a chapter or section at a time and summarise what you have read. If it will help you, I will read the same scriptures and we can compare notes when we get together. If you want me to see and be able to comment post your thoughts on a blog as my pastor does or as notes on facebook like many of my other friends do. What is challenging me and helping me to treasure God’s Word these days is to memorize portions Scripture. I’ve set out to memorize Philippians by Easter this year and even in the first week I have been blessed beyond measure. The amount of scripture memorized isn’t the point, the value that it has in your life is very much the point. Do you treasure God’s Word? Do not be persuaded to put off (or never even start) the basic disciplines that will help you know and grow in Christ. Do not be fooled by arguments that these disciplines lead to just going through the motions to check off a list. No doubt some do and will read out of false motives, but knowing the Word is one of the primary ways in which we grow in Christ. Treasure God’s word. Grow and develop in the basic disciplines of reading and memorization. Journal to engage you mind with the scripture and ask God to help you grow in Christ. I close the letter here by quoting several scripture passages that God has used to speak to me on the subject. But now I am coming to you, and these things I speak in the world, that they may have my joy fulfilled in themselves. I have given them your word, and the world has hated them because they are not of the world, just as I am not of the world. I do not ask that you take them out of the world, but that you keep them from the evil one. They are not of the world, just as I am not of the world. Sanctify them in the truth; your word is truth. As you sent me into the world, so I have sent them into the world (John 17:13-18, ESV). while evil people and impostors will go on from bad to worse, deceiving and being deceived. But as for you, continue in what you have learned and have firmly believed, knowing from whom you learned it and how from childhood you have been acquainted with the sacred writings, which are able to make you wise for salvation through faith in Christ Jesus. All Scripture is breathed out by God and profitable for teaching, for reproof, for correction, and for training in righteousness, that the man of God may be competent, equipped for every good work (2Timothy 3:13-17, ESV). I have stored up your word in my heart, that I might not sin against you (Psalm 119:11, ESV). Blessed is the man who walks not in the counsel of the wicked, nor stands in the way of sinners, nor sits in the seat of scoffers; but his delight is in the law of the LORD, and on his law he meditates day and night. He is like a tree planted by streams of water that yields its fruit in its season, and its leaf does not wither. In all that he does, he prospers. The wicked are not so, but are like chaff that the wind drives away. Therefore the wicked will not stand in the judgment, nor sinners in the congregation of the righteous; for the LORD knows the way of the righteous, but the way of the wicked will perish (Psalm 1:1-6, ESV).